This year I set out to make mugs. For many reasons I chose this form to be my focus. I love to make them. People love to use these little functional works of art. They are not that difficult to ship, but the main reason is mugs flow for my hands and mind with great ease. I have created this form so many times it is second nature to me. I can do it without thinking, like a meditation. 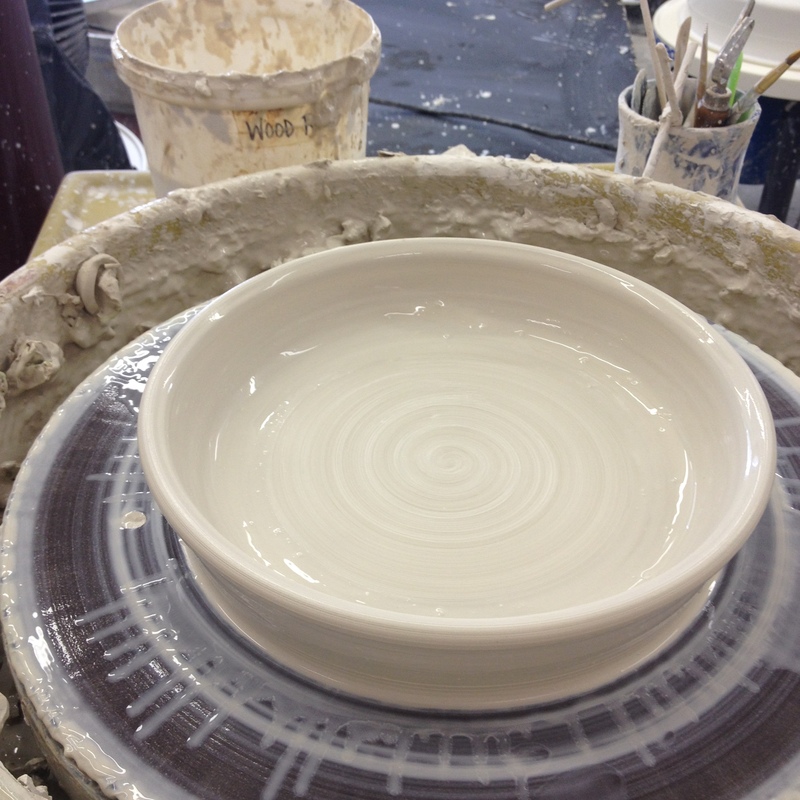 Initially I chose this path at the beginning of the year because I’m a mom by day and a potter by night. I wanted a focus that I knew I could keep up with. As the year rolled by and I got deeper into my mug making I realize there was more to this mug meditation than I had first known. By creating forms I was so familiar with I had plenty of mental space to develop other ideas, surface design and glaze colors. By letting go of one aspect I was able to connect with another on a deeper level. This has been so exciting for me! I learned so much about my glazes this year, the same glaze palette that I’ve been working with for over a decade. This has been profound for my work and is leading me in new and exciting directions as the clay often does. I started the year with a quote about letting go and I really followed the advise. Learning about screen printing on clay and finding new ways to use text on my mugs was interesting. By March I had started working on the moon mugs and they kept my attention for the rest of the year! With each new kiln load I learned something new about my glazes. I ramped the kiln up a little hotter and played with how far I could melt the glazes. I found the results to be enchanting. Which made me want to make more mugs and chase the ideas! This year of focusing on mugs has truly been magical! But as I look back it seems I have come to the end of the moon mug series. I have decided that this will be my final batch of moon mugs for a while, maybe ever. I want to keep myself open to where the clay wants to lead me. I have reached my vision with these mugs and learned what I needed to learn from them. I am so thankful to everyone who purchased one of these mugs this year. Thank you for helping me explore my passion. I hope you are enjoying many tasty beverages out of your mugs. Now, I am excited to take a little break and open myself up to some new inspiration. I am going to remember the quote from my first mugs of the year, I plan to let go and see what happens. Stay tuned! If you are interested in purchasing a piece from this series they are available at Artbound.com. I am starting to think it is the emptiness that houses the present, that emptiness the reason I am drawn to making mugs. Looking back, I believe I came to clay a mug maker. The malleable quality of the clay intrigue me from the beginning. The ability to form it into something so rigid and permanent captivated me. The first day of my first real pottery class I charged in with my desire to make drinking vessels, no yet understanding the complexity of the from. It took a few years to develop the skills need to create anything truly functional. In the early years it was coffee that fueled my desire to make mugs. Like most I enjoy nothing more than the daily ritual of creating that little magic potion that transforms me into a functional human being each morning. Adding to that a mug I crafted or some other artist created adds another level of joy to that ritual. My love affair with coffee and adoration of clay grew up together and as it grew so did my desire to create mugs. Sometimes when I’m sipping coffee or tea I’m inspired to create a certain kind of mug with the specific shape, theme or image on it. Once the idea seeds in my mind I am excited to manifest the form into reality so that I can drink out of it. The whole experience is pure magic! Creating these vessels for myself and others centers me! I love the idea of creating a drinking vessel that will be filled with the users favorite beverage and used time and time again. It is the little things, the belly of the mug or the way your hand fits in the handle just so, your lip on the rim of the mug sipping warm tea, that brings the user into the moment. This is why I make mugs, this is why share them and trade them and sell them. This is why I became a potter, to be present and to share the moment with others. Sometimes I need to just slow down, embracing who I am and accept reality, wait what!? Yeah I said it. 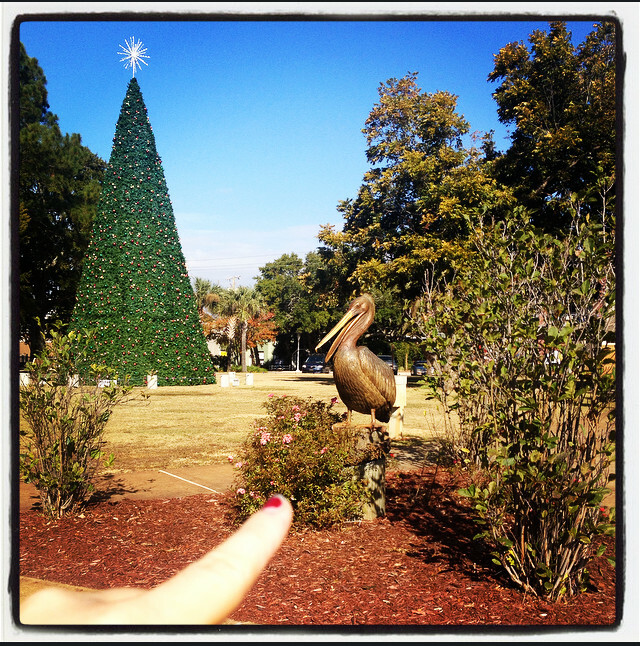 This year I struggled with my strategic planning. I kept thinking I need to do something bigger and better then past years. I want to see growth in my work and business, who doesn’t?! I always have all these ideas floating around in my head and I was thinking “This is the year!” Back here in reality (the reality where I have not updated this blog since we found out we were pregnant with our son over 3 years ago). The reality where I am an art mom, which means this work is my part time job right now and momming/ housewifery my full time gig. Once I started framing my goals that way I had no problem getting my strategic plan in place! After I calmed down and backed up a bit I decided to stick with what I know and love and play with it. So sparing you the boring details… this year I’m going to mostly focus on MUGS because that’s what I love to make and that what I sell the most of!!! Makes sense right? That’s the great thing about goal setting! I decided with each batch of mugs I will allow myself to explore one or two new techniques, which is also very exciting for me. I love to explore the endless possibilities of clay. This way I am growing and learning, allowing myself to be inspired while having simplified expectations. After coming to this conclusion it seem like a no-brainer. I am also excited to announce that 10% of the online sales from these pieces go to Children in Crisis. This is one more way I figured out to give my work more meaning and use joy as an act of revolution. The first batch of pots was inspired by my situation; “Sometimes you just have to let go and see what happens” I’m sure some of you can relate. Its a morning mantra mug! A great way to start the day, with tea, coffee or your morning elixir! I chose to screen print the text, a technique that I had tried a few years back but did not stick with. This time it as a lot of fun and I’m excited to use this process on more projects in the future. It is great for combining my love of hand lettering with clay forms! 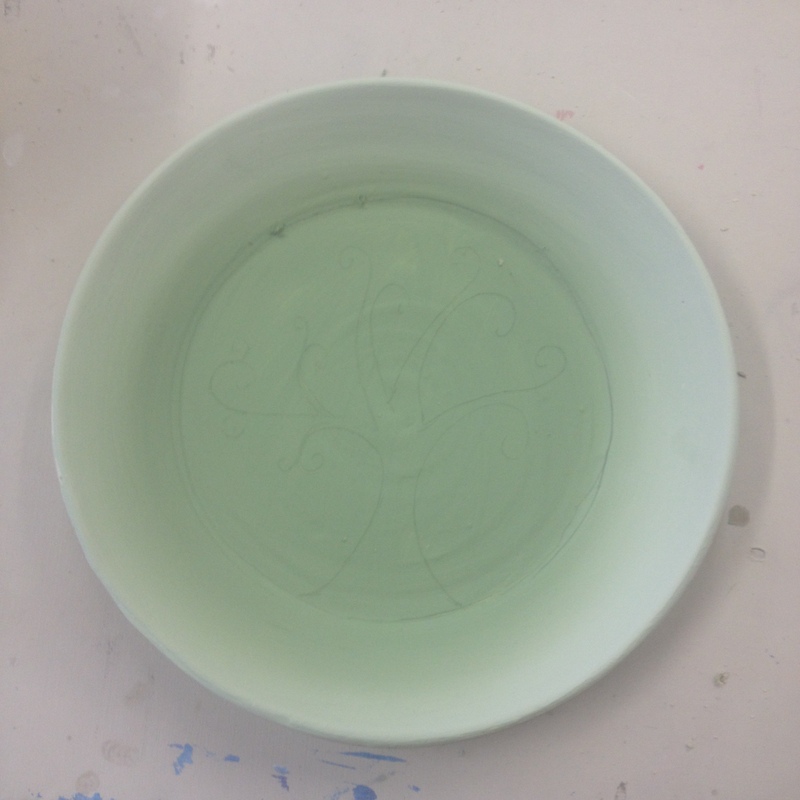 If you’re interested in knowing more about screen printing on clay keep reading! Here is a little rundown of my process. Let me know if you have any questions. I started this project with my journal and pencil. Once I got the lettering how I wanted it I photo the piece and used it to create a vector file in inkscap that can be used to print the image onto transparency paper. I purchased screens from EZscreens, they have great directions if you decide you want to do a screen printing project. It took me a few tries to get the screen burned how I wanted, but that’s part of the learning process. Then I was ready to screen print on clay with slip! The slip needs to be very thick almost dry to work. If it has to much water in it, it will bleed and the text will be distorted. I also found just using my finger to spread the slip over the screen worked best! After that it was business as usual bisque fire, apply glaze and glaze fire! I found the this process to be very rewarding and plan to use it on more project! If you are interested in adding one of these morning mantra mugs to your daily ritual you can find them here in my Etsy Shop. And remember 10% of the online sales of these mug goes to Children in Crisis. Joy as an act of revolution! Let us, let go and see what happens! Whenever I create a collection of art work, there are always the pieces that do not live up to my expectation, the experimental pieces that turn out differently than I intend. I never know what to do with these pieces. For this collection, I decided to turn the less then perfect pieces from “No Fear of Depth” into “Random Acts of Beauty.” I have wanted to do a random acts of beauty project for awhile, and this seemed like the perfect opportunity. most amazing experience. I was at the Peace Pagoda in Grafton, NY wandering around. I was at a transitional time in my life and I was out there looking for some answers, playing in the woods, stacking rock, when my eyes were drawn to a red rock at the base of a tree in front of a little hole. I thought it looked a little out of place and had to investigate. 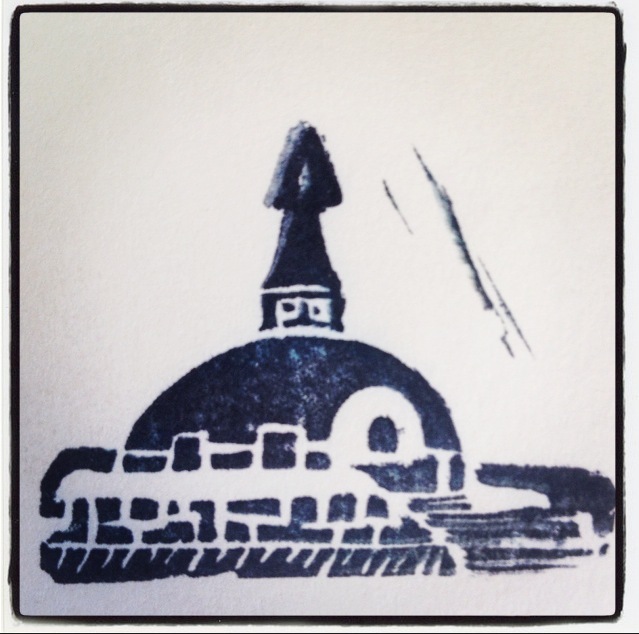 What I found was a beautiful handmade stamp of the Pagoda and a new hobby that would take me on many exciting adventures with friends and family! Since that experience, I wanted to do a random acts of beauty project. I rolled it around in my head many times but could never come up with the way I wanted to do it. Then in October I watched the HBO documentary Banksy Does New York about his “residency.” It showed me a way I could create a social media component to such a project. This got the idea churning again. Then I stumbled across the Facebook group Art Abandonment. After joining the group, I began to get beautiful stories in my feed by crafters, makers, and people hiding and finding hidden works of handmade art and the positive impact in has on their life. I wanted to be part of that beauty. This was an amazing process. The NWF Daily News became interested in it and wrote a nice piece about the project. This helped bring more awareness and got more people involved. Everyone who I spoke with about it said they really enjoyed the hunt, even if they were not the first to find the piece, and many people found out about new places in their home town. On the final day of the project which was also the opening reception of “No Fear of Depth” as I was hiding the 12 Random Act of Beauty I realized that unconsciously celebrated the 12 Days of Christmas. What a happy accident! Its is moments like that I am truly thankful for the arts. If you enjoyed this project and would like to see more like it in the future, please consider supporting me with a donation. You can donate online through Paypal or by sending a check to Full Circle Gallery 29 B Eglin Pkwy FWB, FL 32548. Supporting my work in this way will allow me to do more community oriented projects in the future. Thanks in advance! Late last winter I went to hear potter Tom Coleman speak about his work. He talked about how the landscape he lives in affects the artwork he makes. His ideas really struck a chord with me. He spoke about his move from the coast of Oregon to Las Vegas, and how when he arrived in Vegas the work he created was still very much influenced by the landscape of Oregon. His new work did not resonate with the people of the desert, who were now his audience. However, eventually his style evolved as he became more influenced by his new surroundings. Thinking about this I realized how most of the work I do is still heavily influenced by the years I spent in upstate New York, in the rolling hills of the Hudson Valley. The vibrant Spring is when the whole world seems to be in bloom. Conversely, the cold harsh winter seemed to be when everything was quiet and sleeping. It was there in that landscape that I honed my craft. It makes sense that it would heavily influence my aesthetic. I think the best example of this is my “Tree of Life” dinnerware. I remember painting the first version of that tree on some trays. It was a cool fall day, sitting on the bank of the Hudson as leaves fell from the trees all around me. In retrospect, I can see how landscape has unconsciously influenced my work and the subject matters that I choose. Recalling my move from Troy, NY to NW Florida in the Fall of 2008, I remember many people suggesting I should make work with fish, sea turtles or other marine life. I remember thinking, “Why would I do that? It’s not what I do.” But, it’s hard to ignore those voices sometimes. So, I attempted a few pieces influenced by the sea and, needles to say, they were not a great success. I just was not there yet. My heart was still in New York and the salt of the sea had not yet permeated my soul. Last winter two things happened that brought me to this new subject matter. I heard Tom Coleman’s lecture and I was challenged by Sol Davis to make jellyfish sculptures for a show we were working on together. That show became “Me & My Jellyfish.” At first I was very unsure about making jellyfish. I did not really know where to start. Jellyfish are so malleable, fluid, and full of motion. Clay on the other hand is rigid. Creating these jellyfish sculptures with movement and flow was a great challenge. The first few were just awful, but I kept at it anyways. Then I got into the swing of it and really started enjoying it. As the collection grew I started creating jellyfish-ladies that were something out of a fairy tale. This resonated with me, this was my voice coming through new subject matter. From the jellyfish-ladies to the mermaids was a natural progression. I was captivated by the mystical, make-believe creatures of the sea. The more I worked with the forms the more I started seeing my work in the world around me. Days spent at the beach became quiet meditations on the collection. The more I played with the ideas the more they resonated with where I am in my life both mentally and physically. So often I feel lost at sea, disconnected from “reality”. With a subject like mermaids and sea creatures I can connect to a playful make believe world in my mind. Mermaids symbolize many things. They are free spirits and tricksters, they will play with your heart and maybe even steal it. This is why I have fallen in love with these ideas. Stay tuned for more mermaid inspiration and a tutorial on how I make the Mermaid Sculptures! 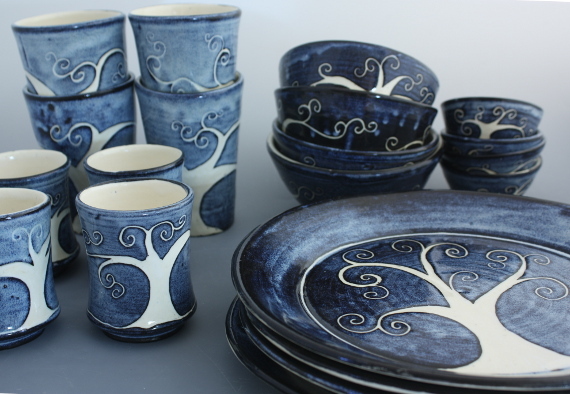 The original “Tree of Life” dinner set was inspired by my love of nature and my good friend, Jennifer. This set has not only been very fun to make, but also quite popular. 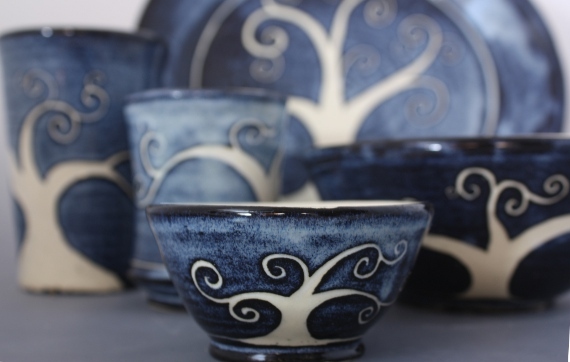 With this set I had only been using black slip, which creates an image that is blackish-blue and white. A few weeks ago I was asked by a customer, through my Etsy Shop, if I could make a set in spring green. I liked the idea so much I immediately mixed up a few new shades of green. I love this kind of inspirational collaboration with our customers, and the creations that come from it! So, from that seed of inspiration grew the “Tree of Life” in spring green. Now I’ll give you an insider’s look into how these pieces are created. For each plate I start with a 3lb ball of clay. For pieces that I’m going to carve I like “Love Stone” mixed by Alligator Clay, in Louisianian. It has almost no grog, so it’s smooth to throw and very easy to carve. 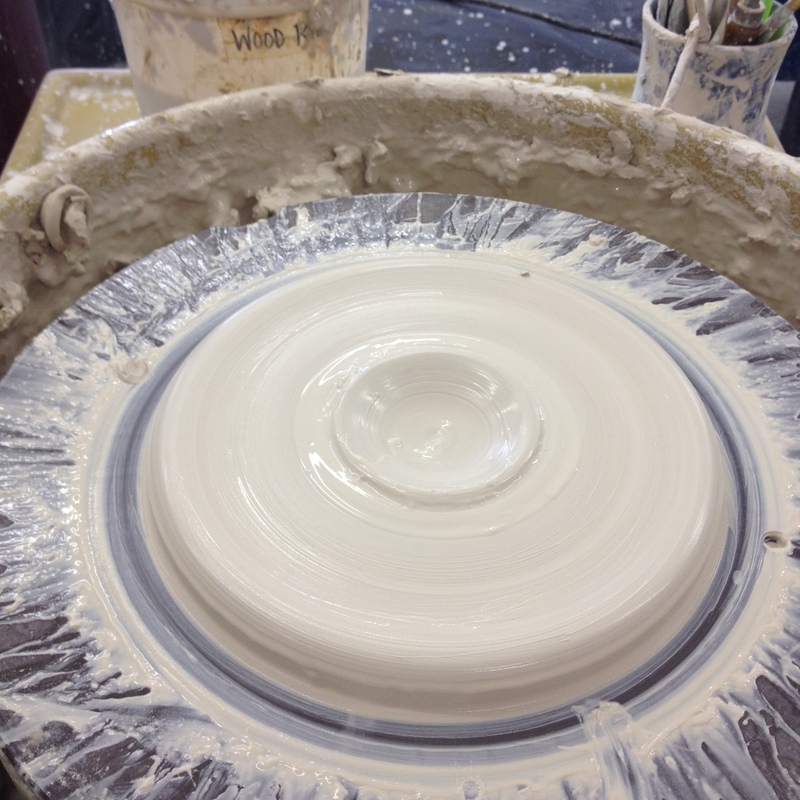 First, I must get the clay centered on the wheel. This is the most important part and I equate it to tuning an instrument. Just like if your instrument is not tuned properly you cannot play beautiful music, if your clay is not centered you cannot make beautiful pots. 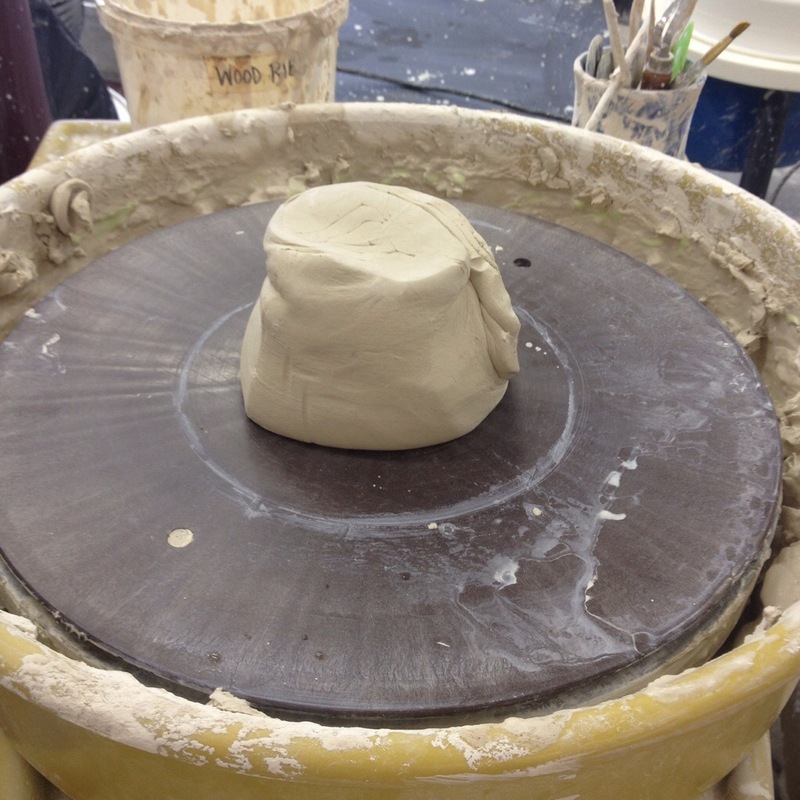 I center the clay low and then begin to open down. Once it is open and beginning to look like a plate, I use a flat rib to compress the bottom. This technique insures that the eating surface is nice and flat. 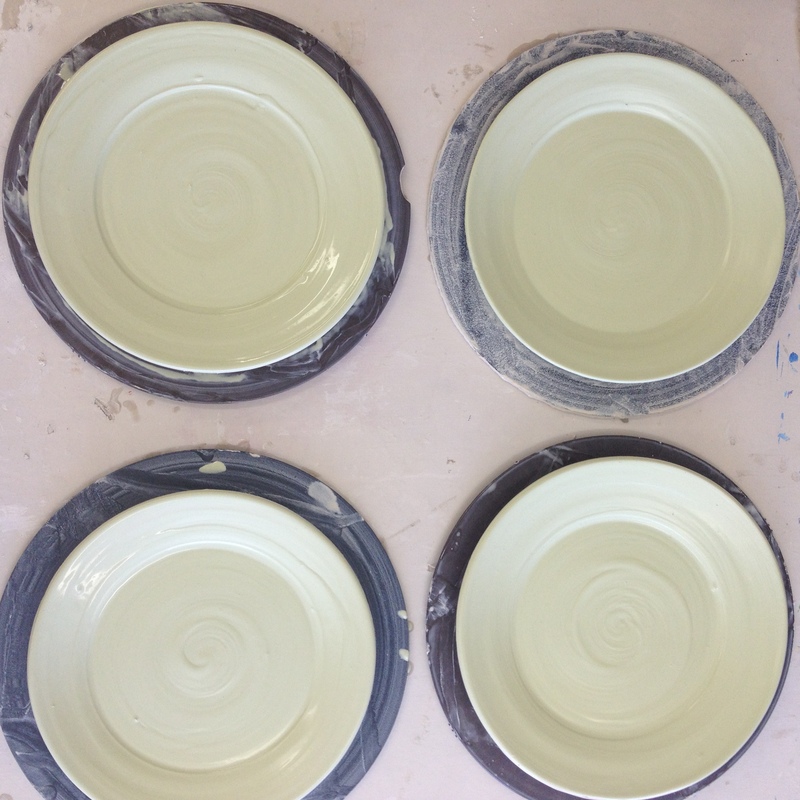 It also compresses the clay and helps to ensure that the bottom does not crack while drying. Next, I pull up the wall. This will eventually become the edge of the plate. 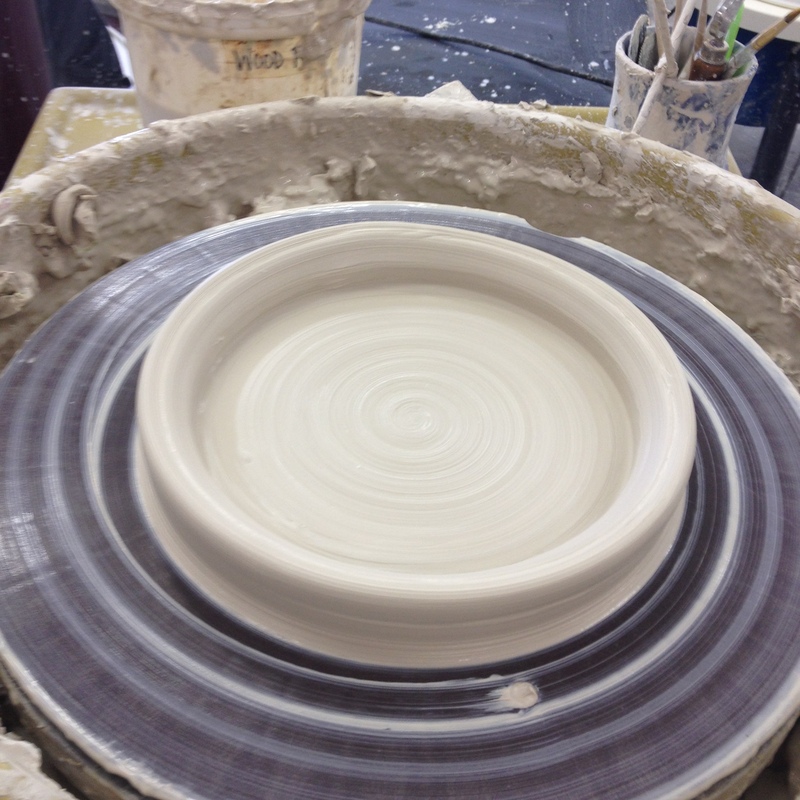 The final step in the throwing process is to create the rim of the plate. 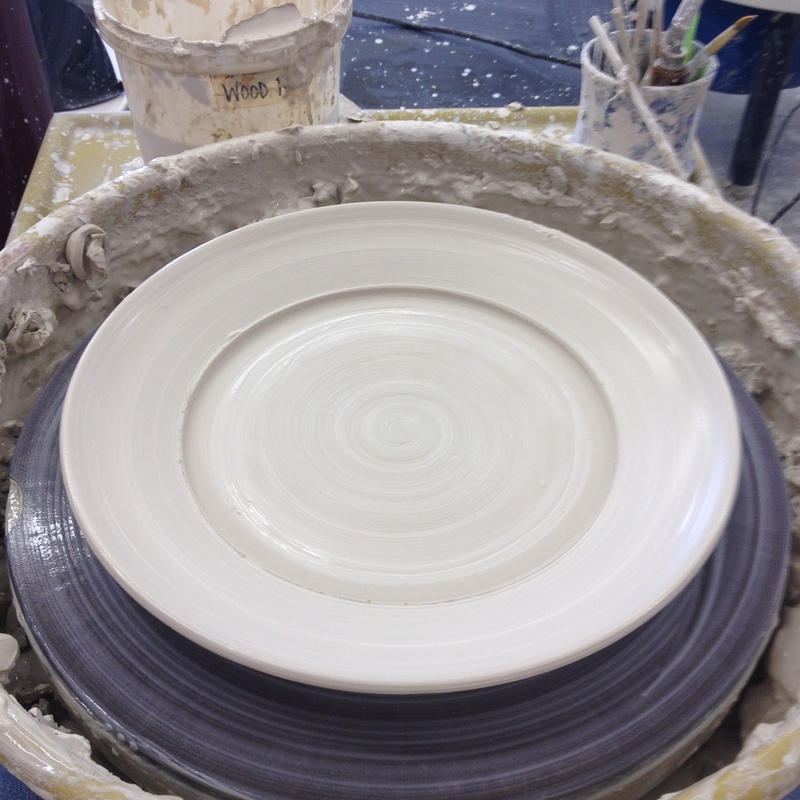 I pull the wall out and then down to get my final plate shape and voila! Before I remove the plate from the wheel I apply the first coat of colored slip. 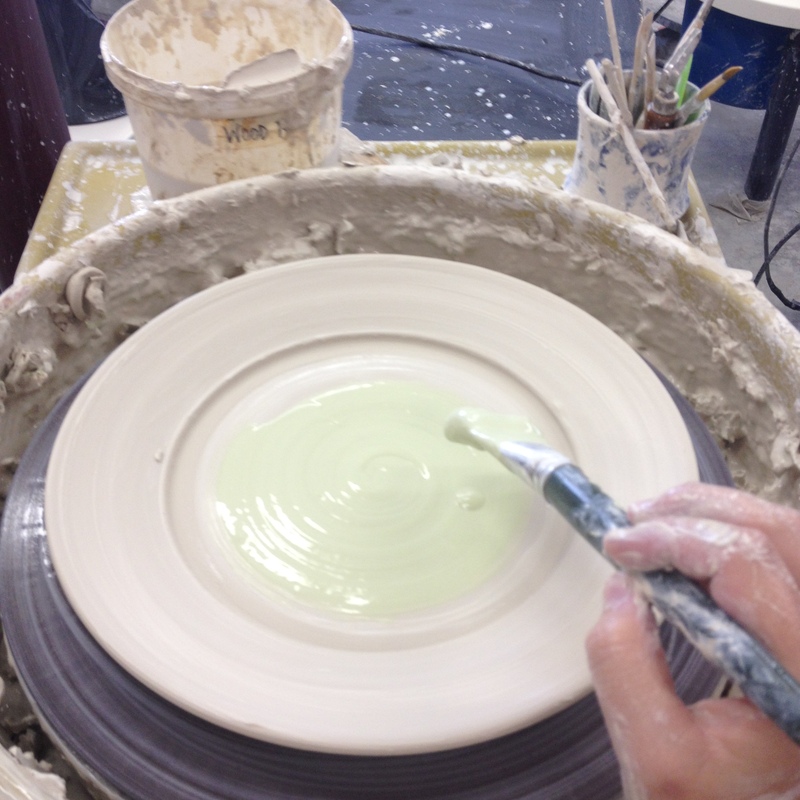 I like to do this while the piece is still on the wheel so I can spin it while applying the slip. I find that this method gives me a nice and even coat. Now that all four plates are made I need to let them dry slowly until they become leather hard. Once they have dried to a leather hard I can begin to design them. 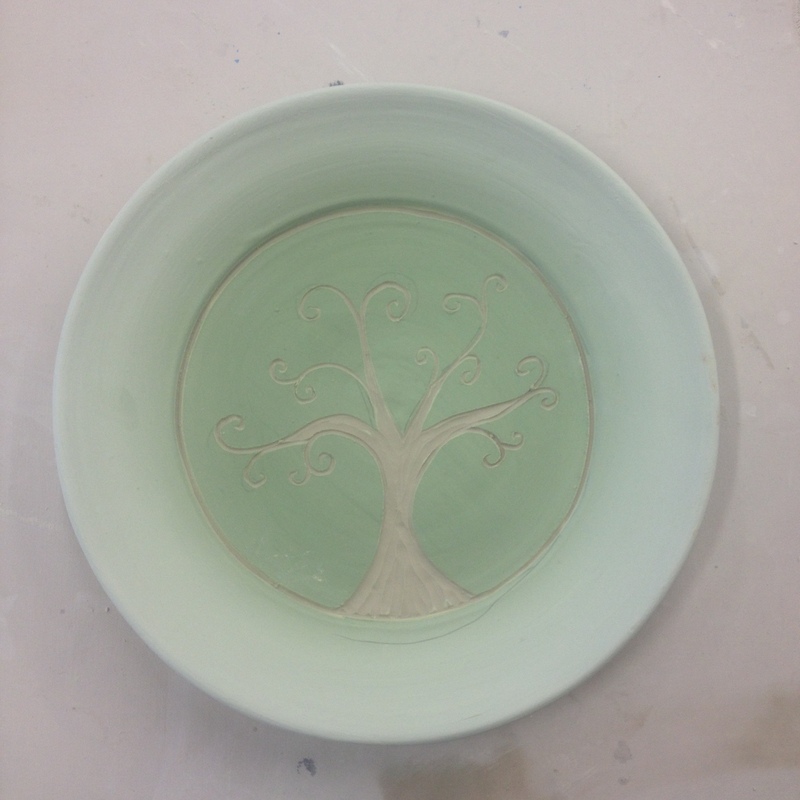 I create the tree image on the surface of each piece using a carving process called Sgraffito. I like to sketch my design on the piece with pencil first, though. The pencil is great to figure out where I want to place the image. Then, I can easily remove any marks I don’t want with a damp sponge. Also, any excess graphite will burn out in the kiln when the piece is bisque fired. Now that I have sketched my design I can finally start carving, my favorite part! Now this plate is done and ready for meals with friends, family and more! 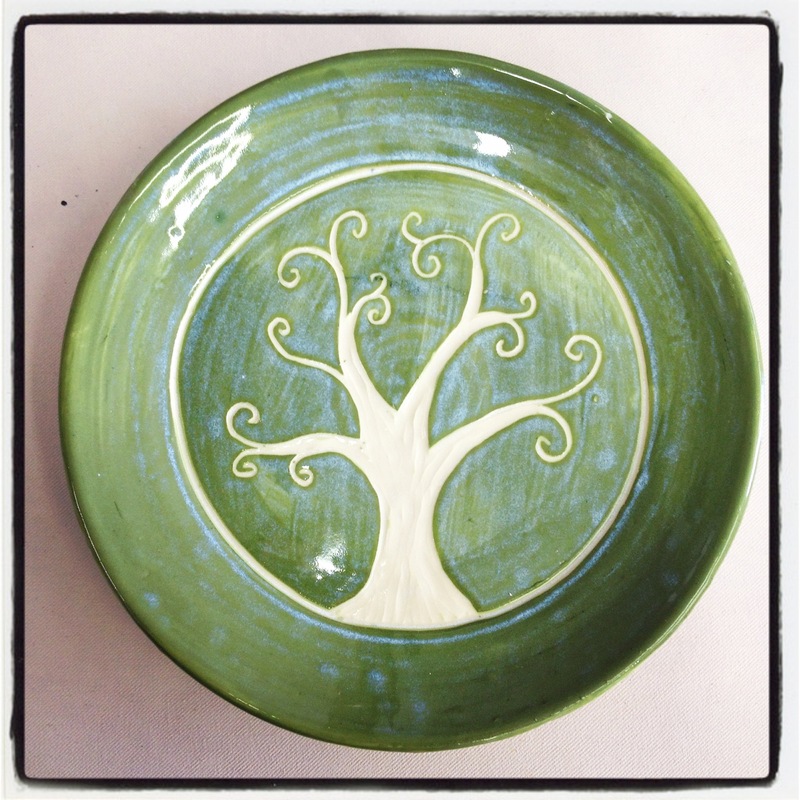 You can find these plates and more of Mercedes’ creations on her Etsy shop www.etsy.com/shop/fullcirclegalleryfwb. each slightly different than the other. Expressing the individuality of all beings. The houses are a metaphor for the facade people choose to show the outside world. While inside each there is a soft vulnerable being, moving ever so slowly with their ego in tow. 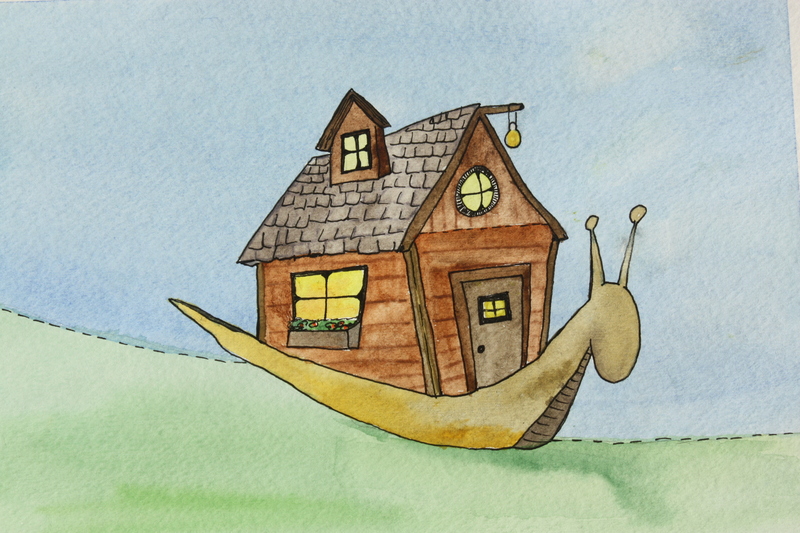 The snail represents the slow steady progress of a soul as it travels through life. I was thinking about the ego and the ego’s baggage, what we choose to carry from place to place and what we choose to leave behind in our constant search for a peaceful place to call home. As this work unfolded in my mind the snails began to take on characters of there own. I sketched and painted, then sculpted and photographed the sculptures. Working back and forth between mediums. Taking the pictures of the sculptures and creating new sketches from them allowed me to see the lines and shapes of the sculptures more clearly in the flattened two-dimensional form. In the process I was constantly going back and forth from the two-dimensional work to three-dimensional work. It was enlightening. As the snails migrated through my mind and on to the paper I found myself making my own slow journey home. 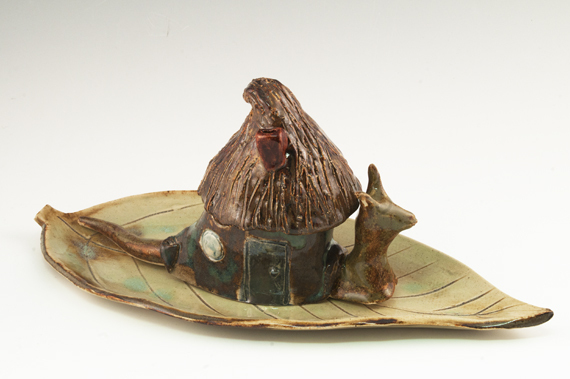 The first sculptural I made in this collection is Penelope. 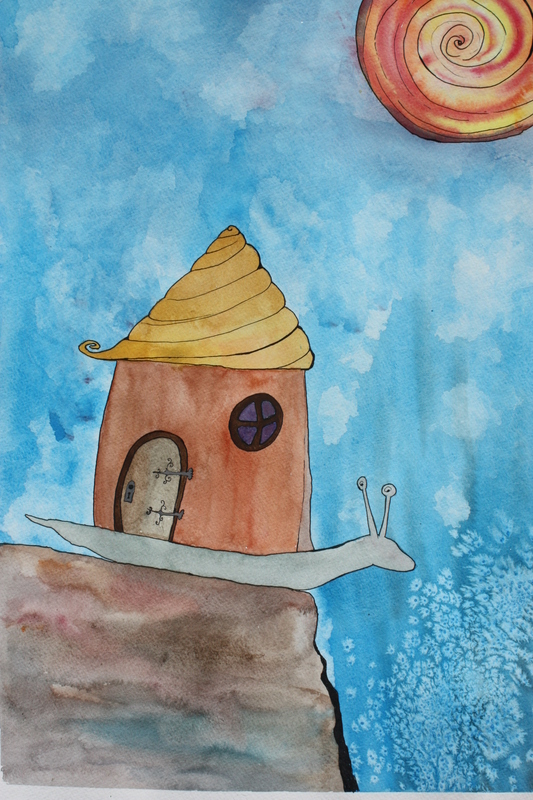 She was a hand-built version of the snail I had been sketching in my journal. As I turned the idea around in my head I realized there were many ways to construct these sculptural forms. 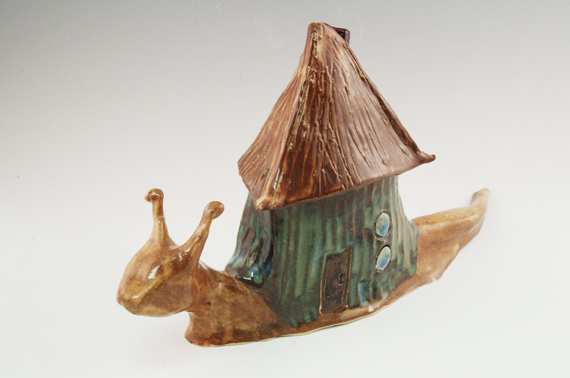 The next few snails I choose to throw the components of the house on the wheel. I created cylinders that would be transformed into the houses and closed forms for the roofs. Throwing and altering these forms, I was able to get a different shape that I could not get hand-building. Once each snail was constructed I went back and added all kinds of little details, doors and window and small window gardens. 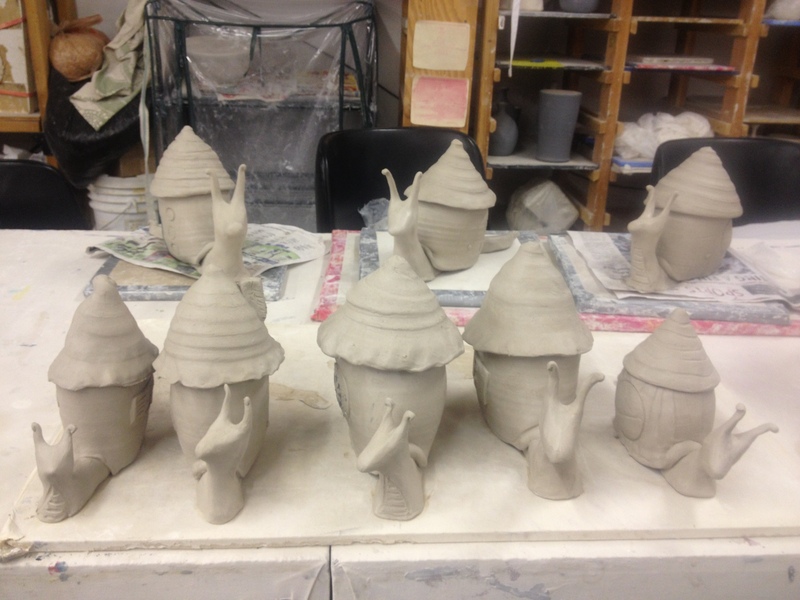 This is when each of the sculptural snails really got their own personality. The paintings started with “On the Edge”, which is really a continuation of the previous series I was working on. I painted this piece because that is where I was at the time, standing on the edge looking into the abyss wondering how I was every going to cross it. In the top of that painting above the abyss is the sun shining and bringing hope. That is what the rest of these piece did they brought me hope. 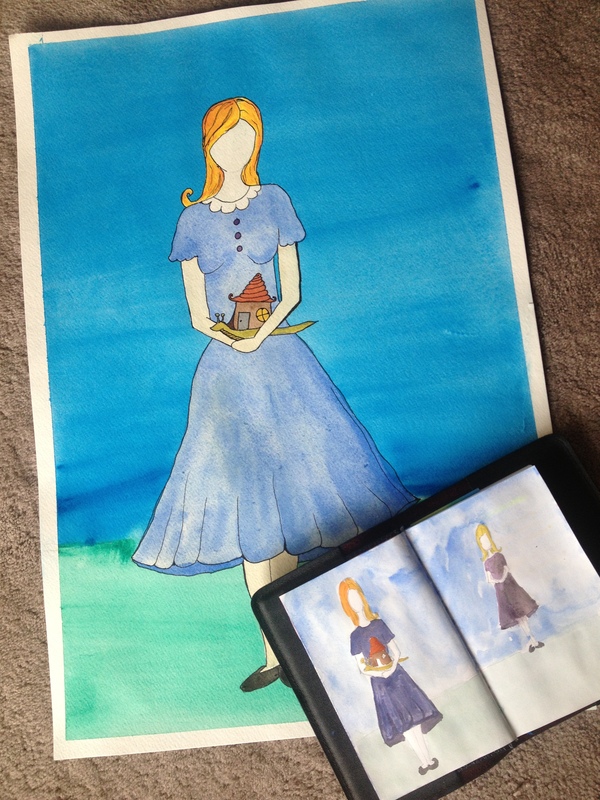 I worked in watercolor sketching in the characters then painting them with masking fluid. Once the masking fluid was dry I flat washed colorful backgrounds on to the paper. When all of that was dry I went back in with watercolor pencils and paint, to add each snails personal details. To to purchase or see more of the pieces from this series please visit the Full Circle Gallery Etsy site. Or contact the gallery at (850)6362-8041. I hope you enjoy them as much as I enjoyed making them!